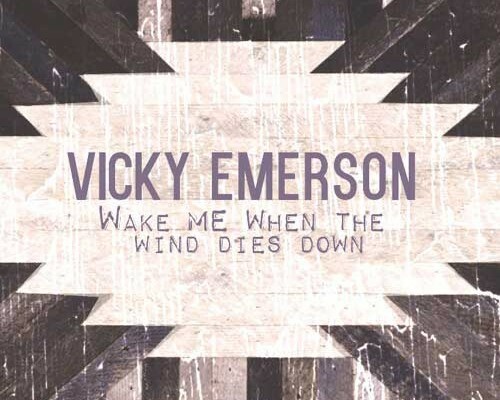 Wake Me When The Wind Dies Down is the third album from one of the foremost practitioners of alt-country today, Vicky Emerson. The Wisconsin native counts Lucinda Williams and Emmylou Harris among her chief influences, but she’s ably integrated current influences like JD McPherson and Jason Isbell into her palette. Her latest release is another example of the latest trend of crowd sourcing the recording of new albums and a decade’s worth of excellent worth enabled Emerson to quickly amass the needed funds to pull off this new album. The result is a ten song set that leans heavily on her roots, yet remains committed to tossing the occasional curve ball in listener’s directions. Emerson begins Wake Me When The Wind Dies Down with the nervy Under My Skin. It’s a credit to her songwriting ability that she can utilize softer sonic textures while still managing to communicate a tremendous amount of attitude that never overwhelms the listener. Rattle Shake is a slowly developing ballad with airy vocal harmonies and a gently loping melody. The song’s lyrics reflect a cleverer, less literal side than some of the album’s other lyrics and Emerson coaxes each phrase with careful consideration. Her poetic side emerges in a stronger way on Silhouette and Emerson explores her folksier roots with another fantastic vocal that effortlessly reaches for higher notes to strike a pleasing ethereal note. The guitar work has a bell-like clarity that compliments her vocal and weaves a dreamy atmosphere. Save All My Cryin’ (For Sunday Afternoons) is one of Wake Me When The Wind Dies Down’s best examples of pouring old wine into new bottles. Emerson co-opts much of classic country’s lexicon for this ballad. It unfolds with tender care, Emerson slowly enunciating each syllable and dramatizing the lyric with a great deal of feeling. Even without knowing much about the song’s subject, particularly its title, listeners will readily detect that Lyndale is one of the album’s most personal songs. In essence, this is a song about letting go, but regret and acceptance live side by side in this song and the accompaniment accentuates that well. September Midnight is another of the album’s longer songs and a superb marriage of music and lyric that inspires Emerson to one of Wake Me When The Wind Dies Down’s best singing performances. The album’s brief finale, Follow The Moon, breaks the moody atmosphere of the preceding nine songs with a playful, poetic lyric and highly appropriate musical backing. Ending the album on this note is illustrative of her confidence. There are a wide variety of moods explored on this release and Emerson couldn’t be more comfortable with each of them. She slips into these songs with apparent effortlessness and steers them to their conclusion with an assurance born from experience. Wake Me When The Wind Dies Down will likely rank as one of the year’s best Americana themed releases and hopefully signals a whole new level of exposure for one of the genre’s great talents. If you like what you hear, make sure to like Vicky Emerson on Facebook by clicking here & a follow on Twitter by clicking here.